Depart by private car for Agra. On arrival, check in at hotel. Later enjoy a city tour of Agra. 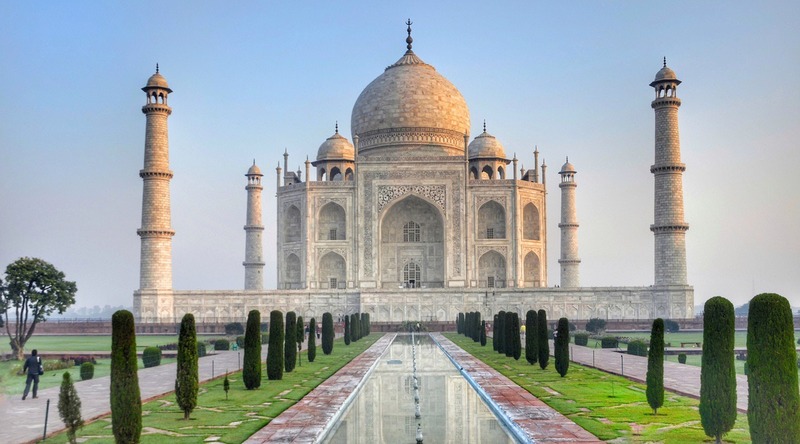 Visit world heritage sites such as Agra Fort and Taj Mahal. The Agra Fort is a beautiful structure with many enclosures built mostly in red sandstone and marble. The Taj Mahal is one of the Seven Wonders of the World and was built by the Mughal Emperor Shah Jahan, for his Queen, Mumtaz Mahal in 1631. Enjoy shopping in Agra and return to hotel for dinner and overnight stay. Take a flight to Srinagar. Today proceed for full day sightseeing in Srinagar, World famous Mughal Gardens (here you can see the flowers and tulips during spring season] visiting the Nishat Bagh (The garden of pleasure) and Shalimar Bagh (Abode of love). Then visit to White Mosque and evening transfer to Dal Lake. Today you will experience the Shikara ride in Dal Lake to enjoy the beauty that God has graced this city with which is often compared to Venice. You will get a view of some very interesting places around the Dal Lake. Overnight stay in Houseboat. After Breakfast drive to Pahalgam (92-Kms) (valley of Kashmir) known as mini Switzerland on the way visit Awantipur ruins and Anantnag sulpher spring. Pahalgam is the most famous place for Indian Film Industry. Enjoy the horse riding at the hilly area. Then visit the nature charm of the Betaab Valley, Chandaan Waadi and White River. In the evening. Overnight stay in the Houseboat.